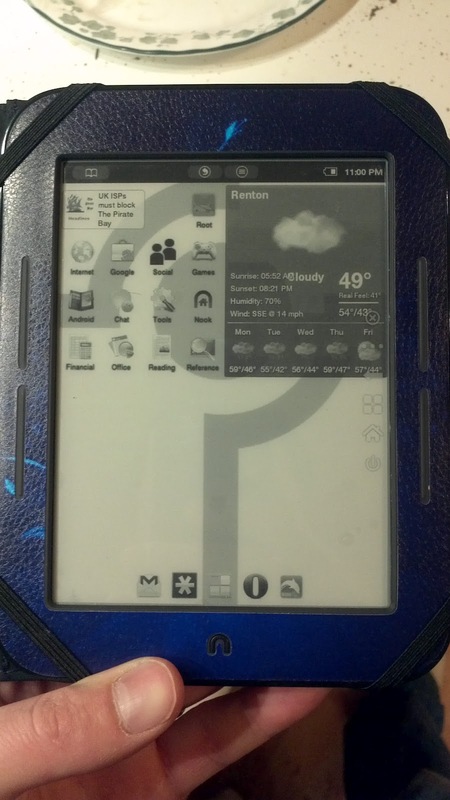 In my last post, I was contemplating jumping into the world of e-books by getting an e-ink reader. I have done so. I also posted on my tech-focused blog about my adventures in rooting it. 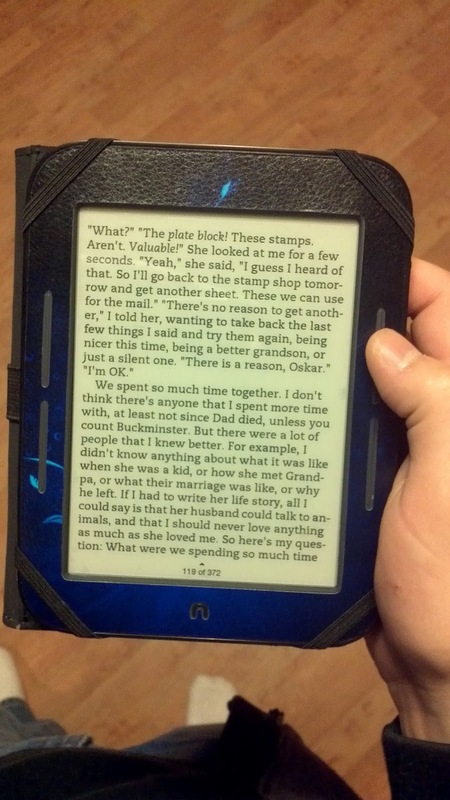 My experience with the Nook Simple Touch so far has been very good. I really like the convenience and neatness that e-book readers offer: no physical books to store or degrade or lug around, customization, instant gratification. I bought a couple of dead tree books within the last few months that I hadn't gotten to reading yet. I really wish they were e-books now. In fact, instead of those, I have started reading a book that I got for 25 cents when the Google Play store was launching, just because it's an e-book. It's not a bad read, it just illustrates how completely and utterly I wish to abandon paper books in favor of e-books, at least for novels. I still prefer to read my paper Bible with all the notes I've made in it, and cross-references easily flipped back and forth to. For heavy reading and research, the paper bound format still has some advantages, but for light, strictly sequential reading, there's no contest. I went ahead and sold my Harry Potter books on eBay; when I want to read them again, I'll get the e-books. I might do the same for my Game of Thrones series. I was worried about single-vendor lock-in with the Kindle. I needn't have been, thanks to Calibre. Calibre is wonderful. 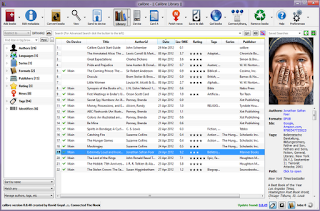 It's an open-source e-book management app. With the proper plugins (which were simple to install), DRM and formats are a non-issue. I already had e-books from Kindle, Kobo, Google Play, and I recently got one from Nook. All I had to do was download the files and drag them into the interface, and the DRM was stripped away. I then plugged in my Nook, dragged the books to the icon, and all of the necessary conversions were performed for me. Books with Adobe's Adept DRM (Kobo, Google, etc.) aren't automatically stripped by the Calibre plugin. Instead, I need to import them into the Adobe Digital Editions application and place them on my Nook from there. Once they're on the Nook, I can import them into Calibre and strip the DRM (Nook uses a different DRM scheme than other ePub stores). Sometimes when I download a cover for an e-book in Calibre, the cover doesn't display on my Nook. I'm not sure what the root cause is, but these books' titles tend to begin with "The". It's not for every "The" book nor dos it only affect "The" books, and I've gotten it to go away by picking a different cover. 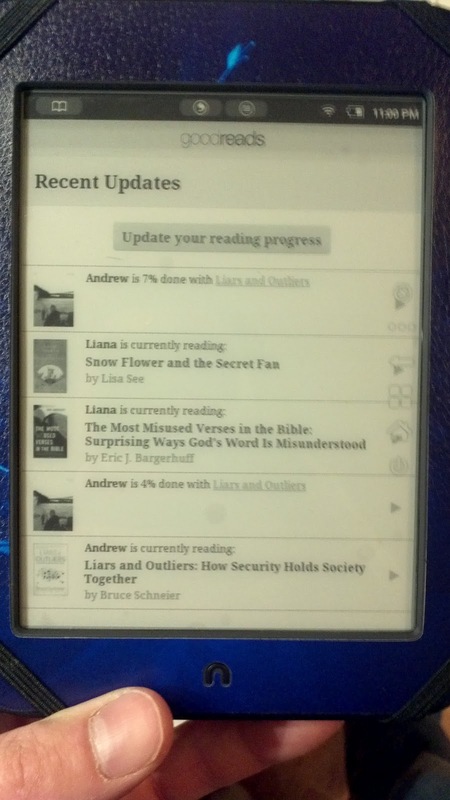 My one complaint is that I wish the Nook would display progress in percent like other readers. Instead, it assigns page numbers, which supposedly line up with those in an actual, published book somewhere (as if that's relevant)--but only one arbitrary edition of it. The only use I can think of for this is for a book club discussion group, or if you want to cite it in a paper the old fashioned way. It makes it so I have to carefully select which particular edition of a book I want to add to my reading list on Goodreads, so the updates will be accurate. I took some advice and got a case/screen cover/skin package. It's nice not to have to worry about the screen getting scratched, or the device taking a hard fall, and the skin makes it look pretty. 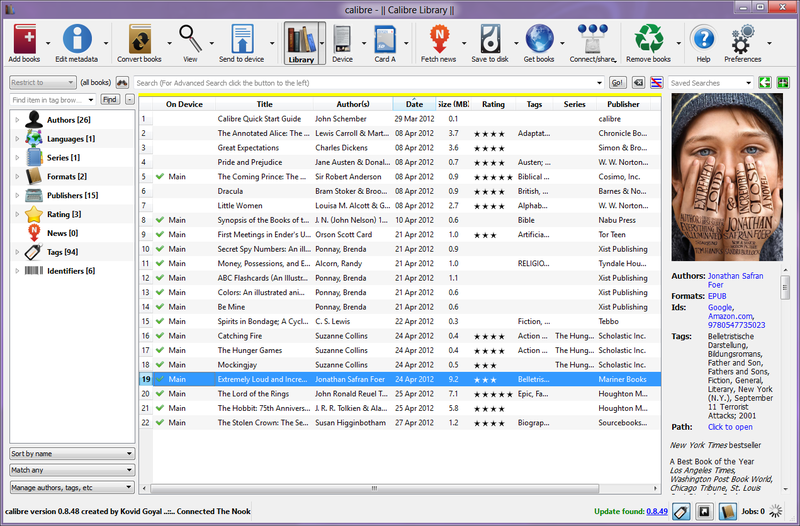 Thanks to Calibre's ability to strip DRM, convert formats, and collect and organize my e-books, I have felt quite free to shop around at different stores. Kobo has had some great discount codes lately, and Amazon tends to have lower prices in general. 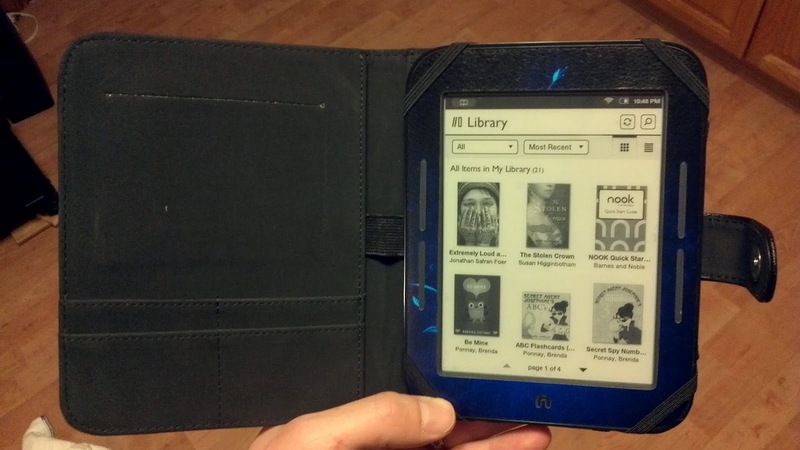 At some point in the future, when my next e-book reader purchase comes up, I might just opt for a Kindle. 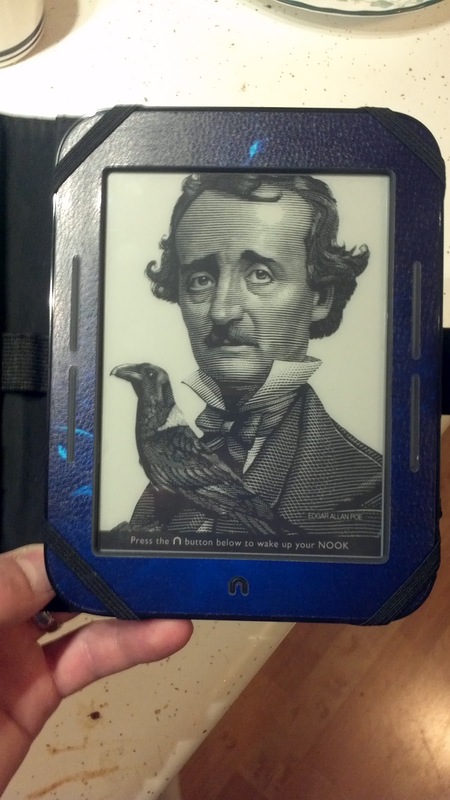 In the meantime, I'm glad I got the Nook. Also, today there was this piece of news, which is most likely a very good thing for the Nook ecosystem.